Renowned Australian artist Ken Johnson is selling his home in the Byron Bay hinterland to help raise money to fund a medical clinic in the Himalayas. 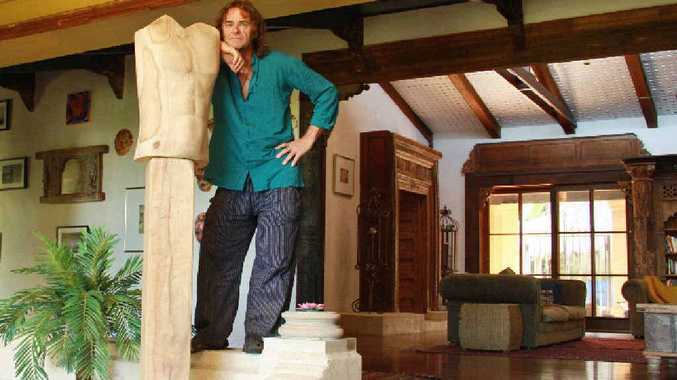 RENOWNED Australian artist and Byron Shire resident Ken Johnson is putting his $2.95 million home on the market to help fund a medical clinic in a remote area of the Himalayas. Located in the Byron Bay hinterland, the home, Incatrole, is Mr Johnson's "masterpiece". "Incatrole is a product of my peripatetic lifestyle and varied approach to art," Mr Johnson said. "I like to be transported when I go to someone's house and that's the effect I wanted here. "I like my life to be eclectic, and I like my home to be eclectic too," he said, explaining the Moorish, Spanish, Indian, Mexican and other influences in the design, materials and artwork in the construction. "I've done my best work here." As Incatrole's design and furnishings indicate, Mr Johnson has spent much time in India, where he says he has developed a connection with the land, history and people. During his travels he saw the need for a medical clinic in a remote part of the Himalayas, and after hearing of people dying on the long journey to seek treatment, he felt moved to do something about it. He also has plans to build an orphanage that will be a school for young sculptors. Nicolette van Wijngaarden of Unique Estates Australia, which is marketing the house, said Mr Johnson deserved to be saluted for his charitable work. "His home is one of the most extraordinary properties I have ever seen," Ms Wijngaarden said. "Imagine the result when a world-renowned artist collects artwork and unique materials from around the planet and spends a dozen years building a home that reflects his own creativity and life. "It's an extraordinary work of art, a masterpiece." Mr Johnson is one of Australia's most recognised artists globally, having had exhibitions in major cities around the world.